An Irish restaurant and sports bar combine forces to make for a relaxed hangout destination. Grab a tap beer from their huge selection of domestic and Irish brews and either some traditional Irish food or classic bar favorites like burgers, sandwiches, cheese curds, and wings. Private party room, open late. Come in for a birthday sundae or shot. 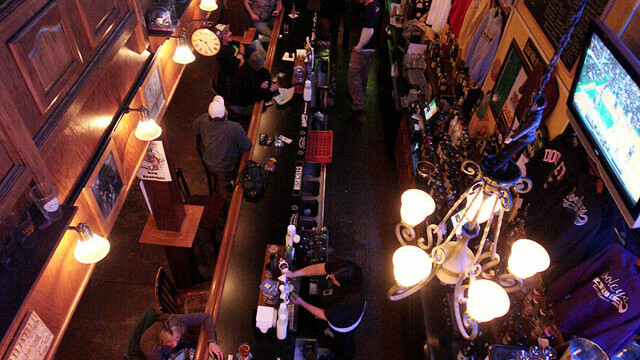 Located a Blarney Stone’s throw from UW-Eau Claire, this Irish-themed bar is bursting with happy hour specials offered from 2-6pm weekdays and from 9pm to 1am every day. Free popcorn, darts, and video games are available as well as 12 tap beers, and over 100 specialty crafts and bottles. Extensive menu past 10pm, which includes some of the best cheese curds in the Valley. Free shot on your birthday.